There are a lot of casual fishermen and even some experts who don’t spend enough time thinking about the fishing knots they are using on a regular basis. 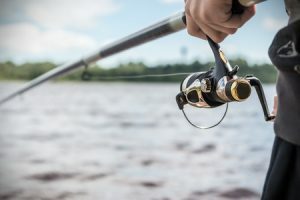 While purchasing the right equipment and educating yourself about certain kinds of fish will improve your chances of being successful when you get out on the water, it’s also important to carefully consider the types of knots you use to tie your line. Here are a few of the fishing knots you should learn more about before you cast your line. Developed by Berkley for use with their monofilament lines, the Trilene Knot is a stronger and more effective version of the popular Improved Clinch knot. It’s particularly effective when it comes to joining swivels, lures, and more to monofilament and fluorocarbon lines. It’s one of the simpler knots to master, and you will appreciate its strength. While Berkley developed the Trilene Knot for its monofilament lines, they developed the Braid Knot for use with braided superlines, though it can also be utilized with fluorocarbon and monofilament lines as well. This knot doesn’t have many weaknesses and has proven to be a better option than choices like the Triple Loop Knot. It’s not difficult to get the hang of making this loop once you practice it a few times. Do you need a fishing knot that will offer you superior strength and resist breaking under a lot of pressure? The Blood Knot can be used to join a leader with a monofilament line, and tests have shown that it will perform the way you need it to when fishing for larger fish that might present a challenge to you. Truthfully, there are dozens of fishing knots that you can and should learn throughout your fishing adventures in order to improve as a fisherman. You can try all of them out during your next fishing trip to Mattice Lake Outfitters. Start planning your trip by calling 800-411-0334 today!